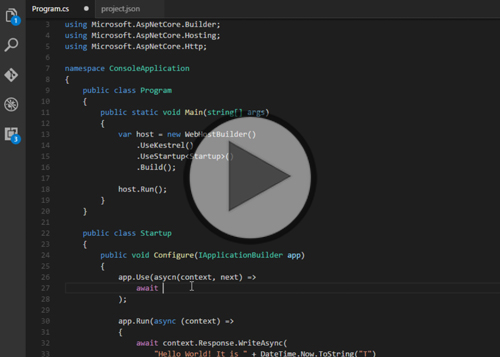 Explore how to bootstrap an application in .NET Core and learn how to build a Hello World app into an ASP.NET MVC application. Discover ways to launch web applications from the browser as well as how to use MVC and the administration of the Kestrel web server. This course assumes that students have some programming background, and at least minimal experience with classic ASP.NET, C#, and Visual Studio. As with any such course, the more experience you bring to the course, the more you’ll get out of it. This course moves quickly through a broad range of programming topics, and is focused on using the .NET Framework with C#. The course also assumed that you are well familiar with how to use the version of Windows that you are running. For example, the course might say simply “open a browser” without explaining how to do that. You should also be able to navigate the folder hierarchy using Windows Explorer.